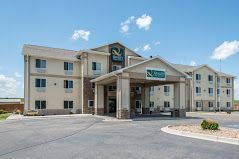 Situated at the intersection of Interstate 76 and the GAR Highway, this simple 3-story hotel is 1 mile from the Overland Trail Park and Museum and 3.6 miles from Logan County Fair. All rooms have en suite bathrooms, as well as free WiFi, flat-screen TVs and coffeemakers. Some also come with microwaves and minifridges, while suites add separate living spaces with pull-out sofas. Complimentary hot breakfast buffet is provided. There are computers for guest use, and meeting space is available. Other amenities include an indoor heated pool and hot tub, a gym, guest laundry facilities and a newsstand, plus free large-vehicle parking.